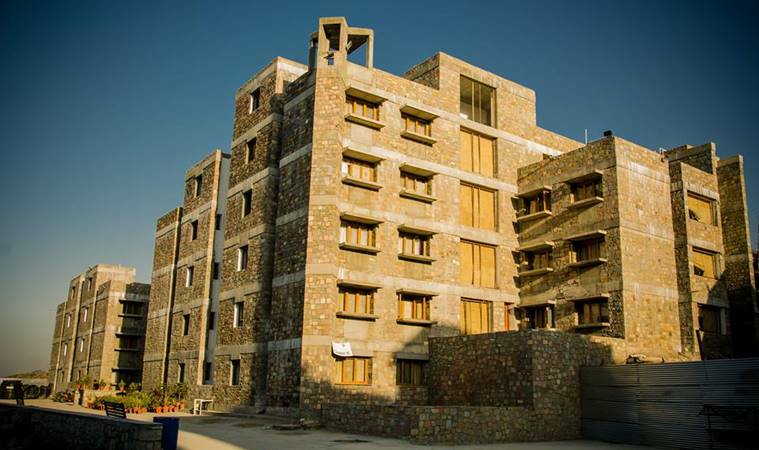 IIM Udaipur is the first among the new IIMs to move into its new campus. The campus is located in Balicha, Udaipur sprawling across a 300-acre site among the mountains. There are many things which makes the campus truly unique, few of which I have listed down below. The new Balicha campus of IIMU is being constructed on a 300-acre site among magnificent hills in the scenic beauty of nature. It is poised to be one of the biggest IIM campuses. Apart from that, the view from the campus is simply breathtaking. The scenic beauty around the campus not only adds to the grandeur of the campus but also instills a sense of calmness and inspiration from nature among the hard-working residents of the campus. The campus is designed after the traditional architecture of Rajasthan reflecting the rich heritage and culture of the state. In addition, the architectural design has been created to minimize energy consumption. Soon a solar power farm will be built to generate electricity for the campus, staying true to one of the core values of this institute- ecological sustainability. Five-star green rating – IIMU campus has been awarded a five-star green rating by GRIHA (Green Rating for Integrated Habitat Assessment). GRIHA is an independent government body that rates buildings on the basis of factors such as energy efficiency, waste management, and use of renewable energy sources. Ecological sustainability is one of the core values of this institute. This recognition reflects how seriously the institute takes its core values and principles. Even the activities in the operational campus are aligned to uphold the core value of environmental consciousness. Infrastructure – Although it might take a few more years for the entire campus to be constructed, major portions of campus such as hostels, mess, academic block, classrooms, library, 40 and 77 seater classrooms, 330 seater auditorium etc. are already operational. Along with this, the campus already has the requisite infrastructural facilities such as transportation facilities for faculty and students, ATM, gym, sports equipment, Wi-Fi facility, ACs inside all the rooms, mess, parking facility, etc. Needless to say, the campus and infrastructural facilities are very important for any institute. But what makes the IIM Udaipur campus truly special are the people residing in it. The students, faculty, administrative staff and everyone staying in this beautiful campus coordinate and work day in and day out to build this campus and make this Institute better every day. Which group of Aditya Birla would you like to work with? A – I would like to work with Aditya Birla Capital Limited (ABCL). It is one of the largest financial services players in India. It has a strong purpose of assisting in the financial well-being of everyone. It does so by offering a wide range of solutions for its customers. In addition to the above, ABCL is a good place to work in as an employee. It is one of the top 3 financial services companies to work for. It has a good work culture and competent management. Given the multiple lines of business the company is into, it offers a wide range of career opportunities to choose from and pursue.